North Woods® Aqua Kleen is a product that cleans as well as mineral spirits, but is completely nonhazardous! Aqua Kleen is a game changer, from both an end user and environmentally safe perspective. Its nontoxic, biodegradable, pleasantly scented formula quickly removes grease, oil, and carbon deposits safely and effectively. Does not require the install, expense, and costly monitoring of eye wash and full containment showers within 20 feet like hazardous solvents do. Designed for use in heated aqueous parts washers, and ultrasonic cleaning equipment. Can be used in manual and pressure washing applications too. Operate according to manufacturer’s instructions. Note: Not intended for use in spray cabinets, or jet washing equipment. Sump Cleaning CNC Machines Add Aqua Kleen at a ratio of 1.5% to the dirty (water soluble coolant) in sump. Run this way for 24 to 48 hours before clean out. Product will significantly reduce time spent and improve cleaning. 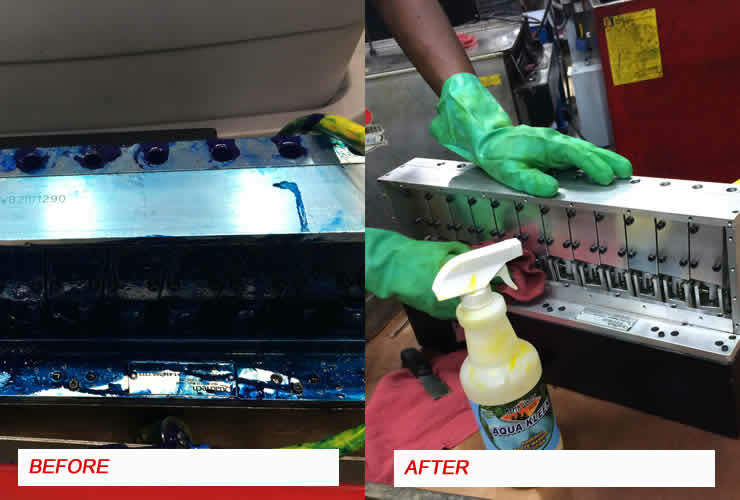 If machining with oils, instead of water soluble coolant, then use Aqua Kleen full strength as a spray and wipe for superior soil removal inside cabinet.